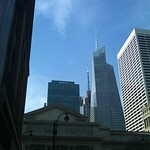 I was staffed on a project in Midtown Manhattan from late January to early May, 2011. One of my friends in Champaign-Urbana commented that it was like a paid vacation. True, except for the part where I had to work 40 hours. Though that part was fun too, of course. I did thoroughly enjoy being in the city for a few months, especially after living in the cornfields for a year and a half. It was awesome to be surrounded by tall buildings, restaurants, public transportation, and limitless entertainment opportunities. Check out some of the photos I took while I was hanging out in NYC.